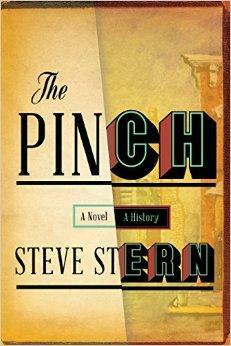 Memphis' Pinch District holds special meaning for novelist Steve Stern, a professor living in upstate New York. The editor, writer and teacher Gordon Lish once wrote: "Steve Stern is far and away the greatest of our unrecognized writers." The New York Times calls him a "Literary Darling." But if there's one thing Steve Stern SHOULDN'T be, it's unknown to Memphis readers. This lit professor at Skidmore College in Saratoga Springs, NY, is not only a Memphis native, he's been writing about us in critically acclaimed books for nearly 30 years. In the 1980s, while working at the Center for Southern Folklore, Stern discovered that the now-desolate Pinch District of Memphis -- the neighborhood just East of the Pyramid -- had once been a thriving immigrant business community. As his imagination filled in the vacant lots with bygone stores -- and stories -- the Pinch took on a life of its own in his head. It's the setting of several of his books. But his latest title, "The Pinch," finally puts the specter of a neighborhood front and center. The Commercial Appeal's John Beifuss wrote of "The Pinch": "Your spirit will soar, buoyed by Stern's fireworks displays of language, sense of humor, deep knowledge of Jewish folklore and culture, appreciation for Memphis history, unflagging energy, colorful Yiddish vocabulary and free-flowing imagination." The Memphis Flyer's Leonard Gill calls the book "enormously entertaining." In our interview with Stern, he explains why he still spends so much time thinking about an abandoned part of town that most Memphians have left for dead. Stern will be signing copies of his book tonight (June 4, 2015) at Burke's Book Store on Cooper Street between 5:30 p.m. and 6:30 p.m.